Have you ever experienced disappointment and excitement at the same time? There’s something you hope for and then it doesn’t happen. But right when you thought it was over, you get distracted by another exciting thing. Well, those are the emotions City of Ashes leaves you with. 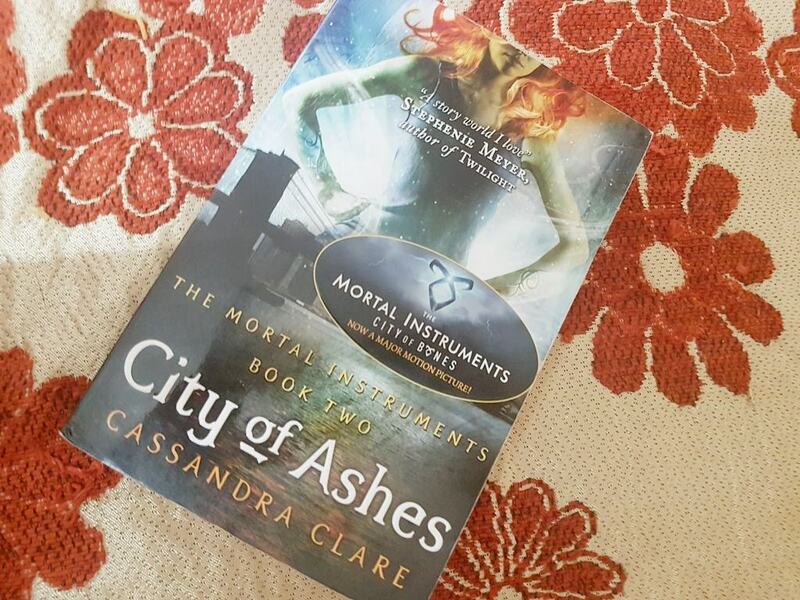 The City of Ashes by Cassandra Clare is the second book in The Mortal Instruments series. The first book City of Bones began with a girl named Clary as the main character. While living in New York, her life was as usual as anybody’s else until one day the world turned upside down. To be precise, she figured out that there’s another world that she couldn’t see before that co-existed with her world – the world of shadow hunters. Shadow hunters are the people who fight with demons and evil creatures. All those creatures like wolves and vampires are as real as humans, and Clary finds out that she is herself a shadow hunter. But just then, she discovers about the evil guy Valentine who is trying to wreak havoc in this world. The City of Ashes continues the story about Clary who is entirely surrounded by dangerous creatures in the second book and also very confused about her feelings for a boy who can never be hers. The plot of the book isn’t original. I mean there’s the world where all these paranormal creatures exist, and there’s a set of society that fights these creatures and keeps humans safe. There’s magic involved too. But nothing of it is new except for a few changes here and there. The shadow hunters and mortal instruments are slightly close to original, but they’re not entirely. The main plot is about the villain and Clary’s adventure with all that. Not a very original plot indeed. But the world doesn’t care as long as the book is written in a fantastic manner. The book one – City Of Bones was a medium-paced and fairly well book. However, City of Ashes was a pain to read in the beginning. It took a lot of courage and determination to keep going. I had heard too much about the series just to leave it. So, I continued, and by the time you reach the middle of the book, you’ll start getting interested in it more and more. The characters in this book are much well-defined than the previous ones. There are certain characters that get big roles in the book, and it was a delight to see them in action. The main characters, however, were just plain. There was nothing new about them, nothing that would excite the reader. Clary is just a girl who becomes the protagonist by chance. She doesn’t have strength in her character that a lead role must have. She can never be the Katniss Everdeen of the Hunger Games or Hermoine Granger of The Harry Potter. She can never be ‘the’ Clary of the Mortal Instruments. She’s just a boring character who is confused, weak and distracted. At times, the plot requires her to be that, but the certain aura the main character has in a book is missing. A big fail for the book 2. Then there are characters like Simon, Jace, Luke, Valentine, Magnus, Alec, Isabelle, Imogen… all very straightforward characters. You just don’t connect with them that well. You just read their names, learn about their part in the story and move on. It was truly a disappointment for me as I feel a book is good when you just fall in love with the characters when you connect with them. The writing style is relatively simple, and the pace of the story is pretty slow in the beginning. There’s nothing that will make you stick to the book at the start except for the fact that you want to read the entire series. Overall, it’s a very slow book, and if you analyze the whole series by this book the City of Ashes (which you shouldn’t but still), you’ll get disappointed. It is truly not worth the hype. But I have heard it gets better, and I hope it does. Will keep you posted about that. Previous articleOOTD With Sareez.com And How I Like To Style Punjabi Suits?